There’s a new movie called “Flock of Dodos” that’s beginning to make the rounds that I think I’d like to see – not that it will make it anywhere near me any time soon. Here’s another clip on it. Last year I read a book called “A Short History of Nearly Everything” by Bill Bryson that, while not directly related to the debate about evolution, is a useful scientific primer for the rest of us. What this book made me realize was just how little understanding I have about how life functions and continues. And that realization lead to another one, namely if a reasonably well-read, above-average person with an M.B.A doesn’t know diddley about the subject, how much worse off are most of the people who are shouting the loudest? Here’s what I’d like to see, just once, a major religious figure speaking on channel 12 and admitting God’s honest truth: that he or she doesn’t know if there’s a higher power or not, that in fact there may very well not be, and that even if there is a God, that it is very likely not interested in us at all. I would appreciate the candor very much. And while that might lead to a public stoning ala Jerry Springer, I think it would also contribute somewhat to enabling a more productive dialogue going forward. Both sides are too entrenched in their positions to admit their own ignorance. This is particularly true of the religious folks but is hardly limited to them. Bryson’s book opened my eyes to all of the hidden processes going on in my own body that are beyond my control and even my comprehension. Did these complex organizations come together by accident? After reading and thinking, I’m not as sure as I used to be that the answer is “Yes”. But I’m not afraid to say that I don’t know. Are you? Since this picture of “Muhammed the Mad Bomber” by Kurt Westergaard seems to be disappearing from the Internet, at least in its original form, I thought I would keep it alive in a small way. 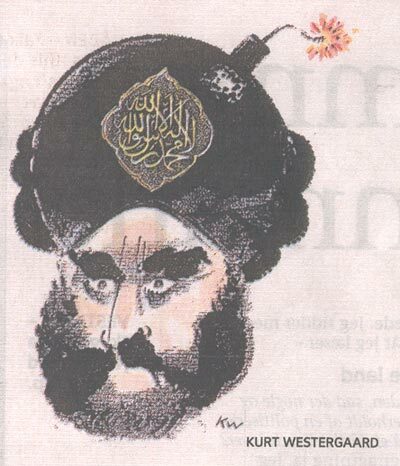 I suppose a clever denounciation of religious fanaticism would be in order as well, but no one who thinks that a drawing like this should be met with explosives would listen to anything as trivial as reason, so why bother?